Did things just get classy? Why yes, yes they did. They help manage your site easily. They give your site a professional appearance in mere minutes. They future-proof your information for upgrading or changing by using the WordPress base. In short, I like ’em. There are plenty of free themes. I’ve used them, I’ve coded around them, I’ve tried to make them work. Yet, this is the same decision I’ve encouraged you to make through all of my resources. You want your site to look professional and (perhaps even more importantly) you should spend time creating great content, not fixing errors on a theme that’s not working. Free themes often fall short when it comes to support and the flexibility to really give a WordPress site the layout it deserves. Many times free themes don’t allow you to adjust the sidebar width (important for adding advertising), don’t regularly update (important for security reasons), or skimp on the very important SEO tools. Sadly, every time I’ve realized this it was after spending hours (if not days) trying to make a free theme work. All of these themes I recommend let you do the most critical things you require. 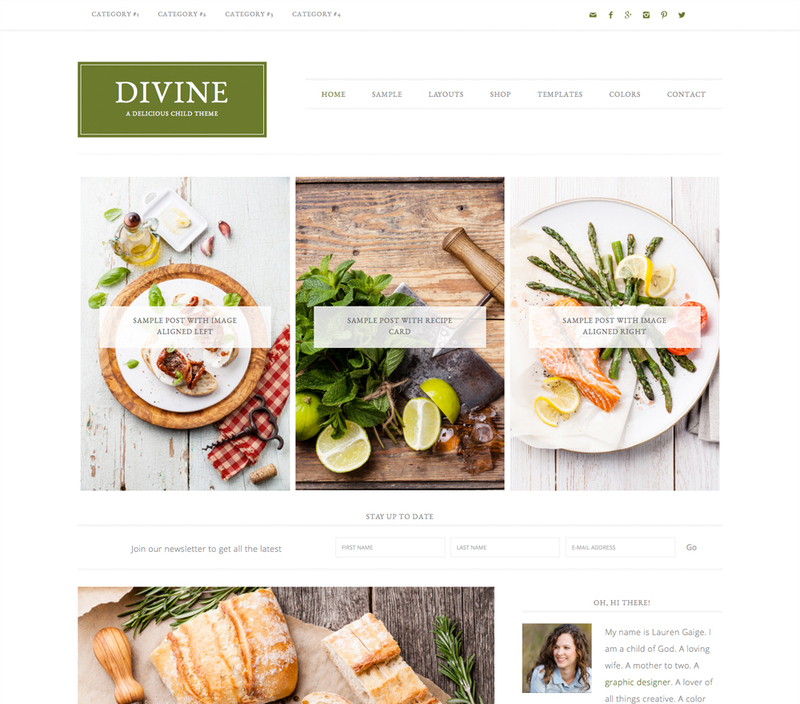 Although there are lots of great premium themes, I should note that all these themes I recommend are my favorite themes for food blogs (or any photography heavy, social media integrated site). However, let me summarize this entire page: I demand the the best option available (within reason) for myself and my websites. I have tried and will try almost anything available to make sure I’m at the forefront of awesomeness. These are the themes and frameworks I use and deliver results. Genesis has been available for many years and I originally avoided trying it. I didn’t like the idea that I would need to buy a framework ($59 one-time fee) and then a theme on top of that (usually $40 – $70). So, why am I recommending this at the top of my list now? Genesis is the combination of everything you want in a WordPress website – SEO optimization, variety of layout choices, ability to edit design customizations, and a great support network. Studiopress (the company that sells Genesis) explains what they do using a car as a metaphor. 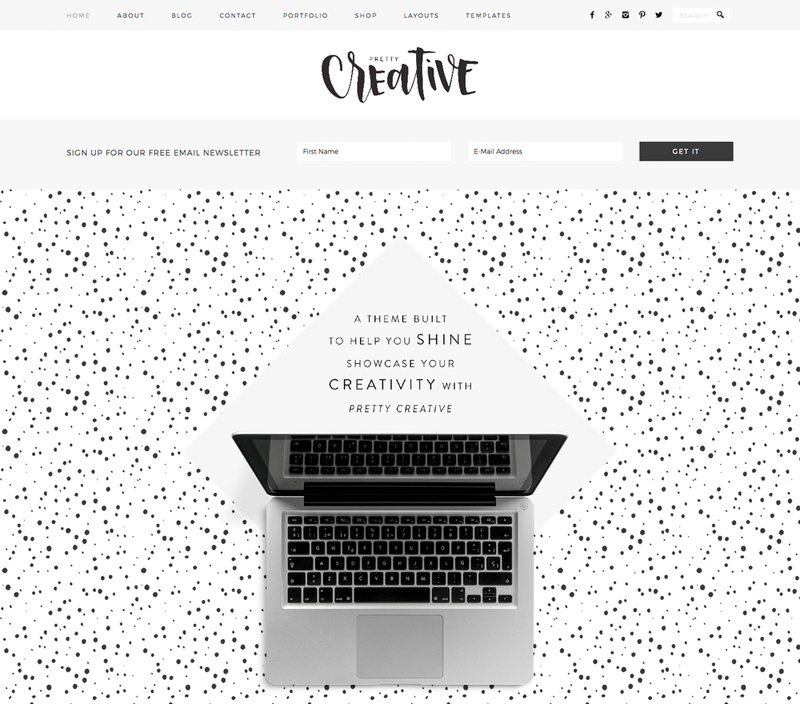 WordPress is your engine, Genesis is the frame, and a StudioPress theme is your paint job. 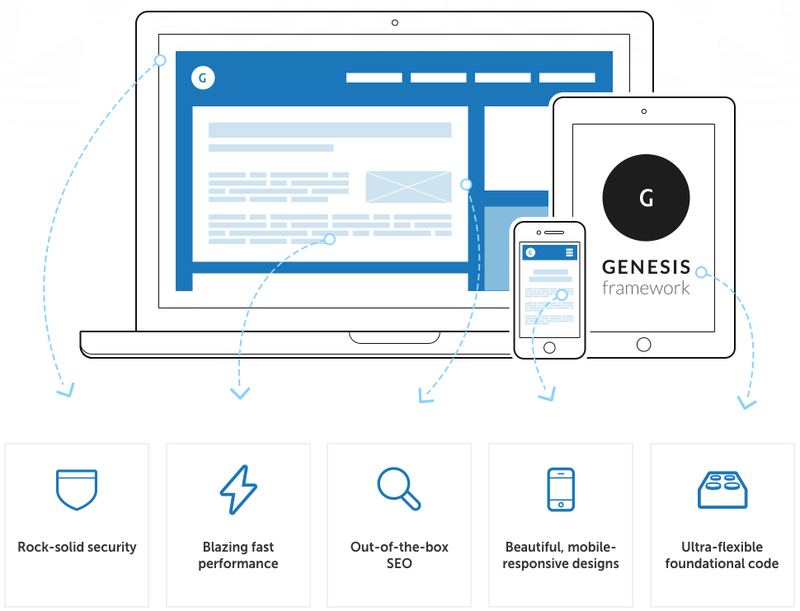 With Genesis, you’re going to get all that rock solid underlying support (stuff none of us want to deal with but need to be working well), while not spending days making your site look professional. Not only does Studiopress have a number of themes they sell, but they have a wide variety of options varying from in-house designs to those created by 3rd parties. I also always like to see a large list of resources on a theme site, as I’m sure I will run into questions. Here’s the list of resources by Studiopress. One other major benefit to Genesis is that there are over one hundred plugins designed for use specifically with this framework. So, let’s say you want to edit the footer, but don’t really want to get into the code to find where to change the text. There’s a plugin for that! How about a clean email subscription box? Yup, there’s a (great) plugin! I have developed many websites on Genesis (including Minimalist Baker). Although this is a rock solid framework for custom designs, so far I have found almost all the flexibility I needed available within a Genesis child theme. After getting my hands a bit more dirty and really customizing these themes, I’m more convinced than ever that Genesis will continue to grow and remain the dominant WordPress framework. It’s a tight package of options and provides both the flexibility and functionality I like to see in a WordPress theme. There’s a bit of a learning curve, but you’ll do some learning no matter what theme you end up using. The benefit here, however, is that once you start to learn how to use Genesis, you will learn tactics that will help you in managing your site for many years. Since Genesis is your framework, even if you eventually change your child theme, you’ll still be able to understand the basic structure of your website – a tool that is incredibly valuable. Genesis is a great all-around package for giving your site that professional look and making sure the important details are regularly updated and working well with WordPress. It’s relatively affordable, extremely flexible, and full of support tools. I liked this theme so much that I created a Foodie Pro Review and Master Setup and Customization Guide! The real benefit to this theme is the built-in gallery option. That’s a big thing that doesn’t exist on many other themes, but can be very important for creating such a visual-focused site. A solid alternative to Foodie Pro. Designed by the same developer, this food-centered theme offers lots of widget flexibility and, most importantly, a recipe gallery. Unique layout options and has some good styling for recipes already embedded. Another unique layout that has some styling for a recipe gallery. Sort of has a fancy-minimalist feel. And again, here’s the full list of Genesis Themes. Elegant themes operates on a subscription platform and lets you purchase a membership for $69/year. Considering that they offer a number of really great designs, this is great deal to be able to try a few different styles to make sure you get a design that works for you. Don’t let the annual pricing confuse you. If you want to only sign up for a year and cancel your subscription, you could continue to use the any theme installed on your site. The benefit of staying a member is that they continue to add new themes and provide updates for themes. Elegant themes is probably your best option for having a great looking website ready in the least amount of time. All of these themes look great and work right on top of WordPress. Another benefit is that all themes come with a little interface that make it easy to change colors and small details about your pages without getting into any code. 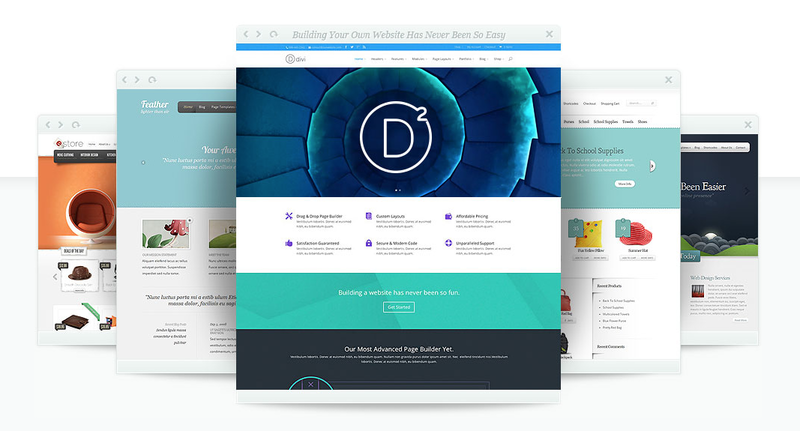 My favorite theme they option is Divi, which is also their most flexible theme. However, the other themes lack in overall flexibility. Although they have a great support network and forum, I’d only suggest using elegant themes if they offer a theme that is close to the final design you want. For instance, changing the sidebar width is possible, but not nearly as simple as it is to do on Genesis. If one of these themes looks close to the design you had in mind, I’d highly recommend them. They are quick to setup and integrate with your site. Then, if your needs change, you’re only out $69. 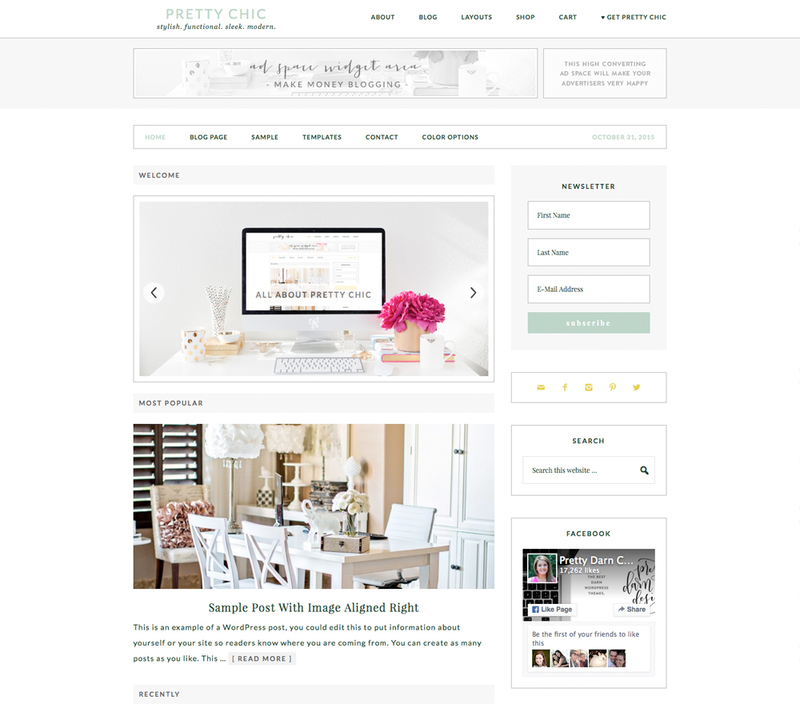 I’ve designed a number of sites on elegant themes and they were our first paid theme service. It was a great option at the time until we needed some more flexibility and I was willing to start learning how to customize our site a bit more. Note: Elegant themes also offers a developer option for $89/year which includes premium plugins and a few other perks. I’ve occasionally used ThemeForest to look for themes that are different or have a very specific style. They don’t have frameworks and usually only work for a couple years, but might offer another option if the above solutions aren’t what you’re looking to create. Although they don’t have a framework or some of the other benefits of the previous options, they are still highly-visual and good options if you find something that fits your personality and site. You can check out all of the themes available here. For the past couple years, however, Genesis and Elegant Themes have done everything I’d need and continue to be my top recommendations. I used to have a long description about my use and understanding of Thesis. However, I can simplify my rambling to some straightforward advice: Don’t use Thesis. Minimalist Baker was originally designed on Thesis and later designed on Thesis 2.0. I don’t know the whole story or what exactly happened, but this was one of those themes that had its glory days and then fell far behind. I wanted to still mention it as you can probably find other reviews claiming this is still such a great framework. Most of those recommendations are based on using Thesis 1.8.5, which was a great theme five or six years ago. Version 2.0 is much more difficult to use and deceptively complicated. All this to say, I would specifically not recommend using thesis. I’m not even going to link to it any longer as there’s no way I can suggest this as a reasonable option. I designed two versions of Minimalist Baker on Thesis before moving to Genesis. I have no plans on leaving any time soon. I know some of these options seem a bit cost prohibitive at first, but really, a small investment goes a long way when setting your site up correctly. If you can afford it, I’d go with a Genesis theme. If you need a more affordable option, Elegant Themes will do the majority of what you need without breaking the bank. Want more? 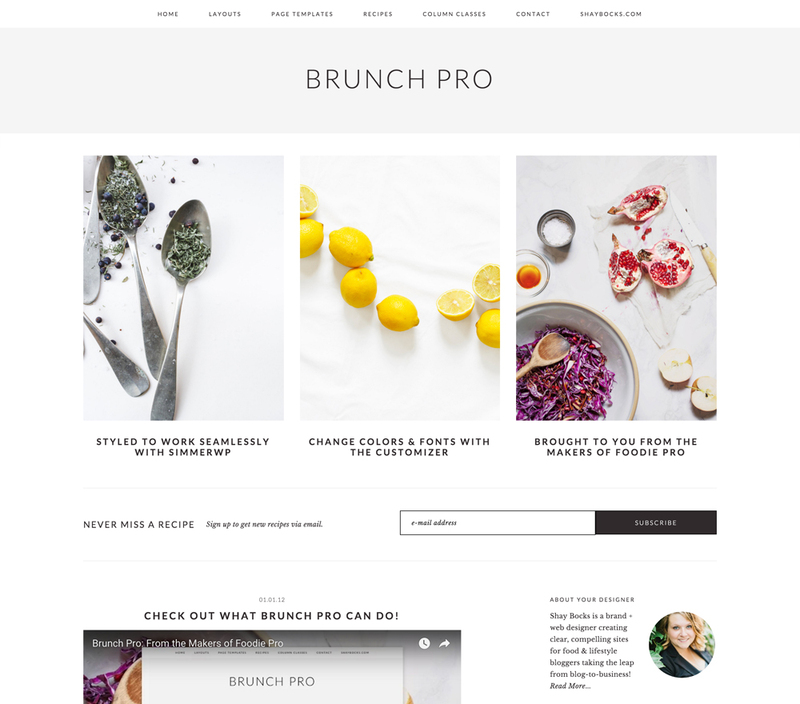 I curated a full list of my favorite WordPress Themes for Food Blogs. Also check out all the resources I recommend and my Foodie Pro Review and Master Setup and Customization Guide! Sorry, but I’ve turned off comments on this post as I was having a hard time succinctly responding and making time to create new resources. The best way I can help if you have a question is if you hit me up on twitter! I wasn’t really sure where to post this question but I figured this was as good a place as any. When writing a recipe I’m not exactly sure how to write the prep times for certain recipes. For example I use dates as a sweetener a lot. And for some recipes I soak them overnight or for 4 or more hours. How are you supposed to write that into the prep time. I use the Easy Recipe plugin and there is a place to put the prep time & the cook time, so would I write overnight or 8 hours for the prep time when really you aren’t “prepping” that whole time or do I just add in the time it takes to put the dates in a bowl of water. I dont want to turn people away with a recipe that looks like you have to prep for 8 hours. I’m just not sure the recipe writing criteria for this. I have googled all over the place and I cant find the answer I was hoping you could share what you do. I’m not sure there’s a perfect answer, but we try and just be as honest and straightforward as possible. Usually that means prep time is the time actually spent preparing the food, not the waiting time. However, this can vary depending on the requirements of the recipe and what gives the most accurate representation of the work required to make the dish successful. Would you know if the white background can be extended to the entire screen? It shows the blog as a page on the grey screen. Just wondering if you knew if that could be tweaked around with. Also, just want to learn this a bit more. A theme and hosting site is all you need to get your website up and running, correct? Or am i missing some other expense? Thanks so much. Modern Studio is brand new and I haven’t played around with it yet. However, it looks great (and I have full confidence in the Genesis Framework), so I hope to use it for future projects. 1. No automatically populated Recipe Index, which is tricky to add if you’re not an advanced coder. 2. The sidebar area shrinks a bit depending on browser width. This isn’t a huge issue, but if you run any ads or anything that will require 300px width, it could a failure to display correctly or other problems. However, this is probably fixable if necessary. 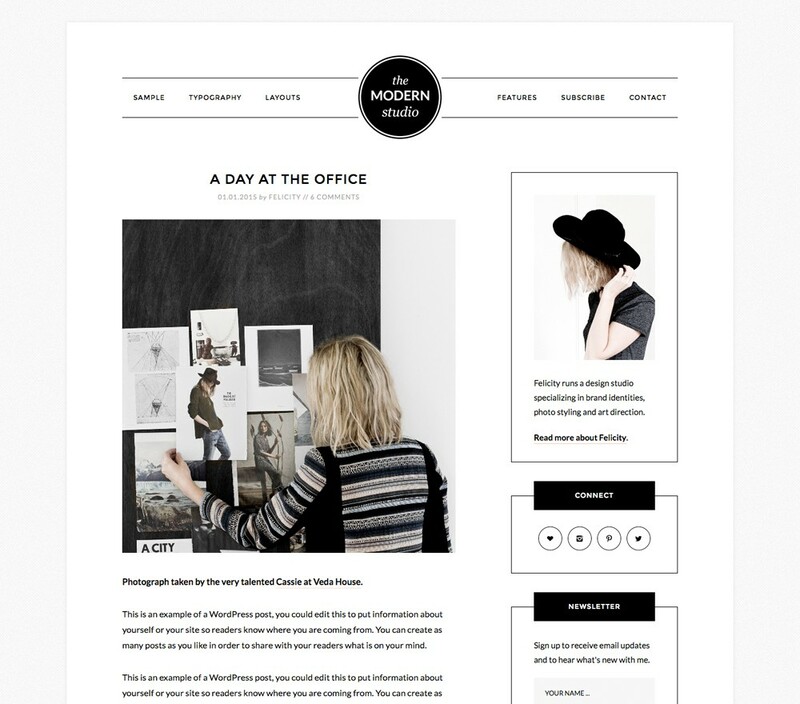 Thanks for your response I finally set up a blog with a free wordpress theme to get started. Can you tell me why my pictures would not upload. It says the blog has a capacity for 2 MB. But that would lower the quality of my photos. That sounds like more of a WordPress / host issue and something to work through with them. I will mention, however, that there likely isn’t a need to have your images so large. Most images, even with high quality outputs are still less than 1 MB. First off I just wanted to say THANK YOU so much for making these guides, I’m not setting up a food blog but they’ve been completely invaluable! My blog is pretty much done (all thanks to you! ), I’ve applied for adsense etc however I just can’t figure out how to add that little picture and the small ‘about me’ section in the primary sidebar. It’s probably staring me right in the face, but would you mind terribly pointing out how to set it up to me? Hi Susie! I actually covered that in this tutorial for Foodie. I have previously used Squarespace, but am about to set up a new wordpress blog using a genesis based theme so your site has been very helpful – thank you for sharing. Now I am trying to choose a web host and am thinking maybe Site Ground. But I was wondering, which web host do you use for this site? Hi John, I’m just setting up my website and wanted to ask your advise about the Genesis theme Daily Dish Pro. I’m really impressed with the Genesis framework (learned about it on your site) because it has all the features I am looking for (images, website format, blog and newsletter) so I won’t have to get them individually. 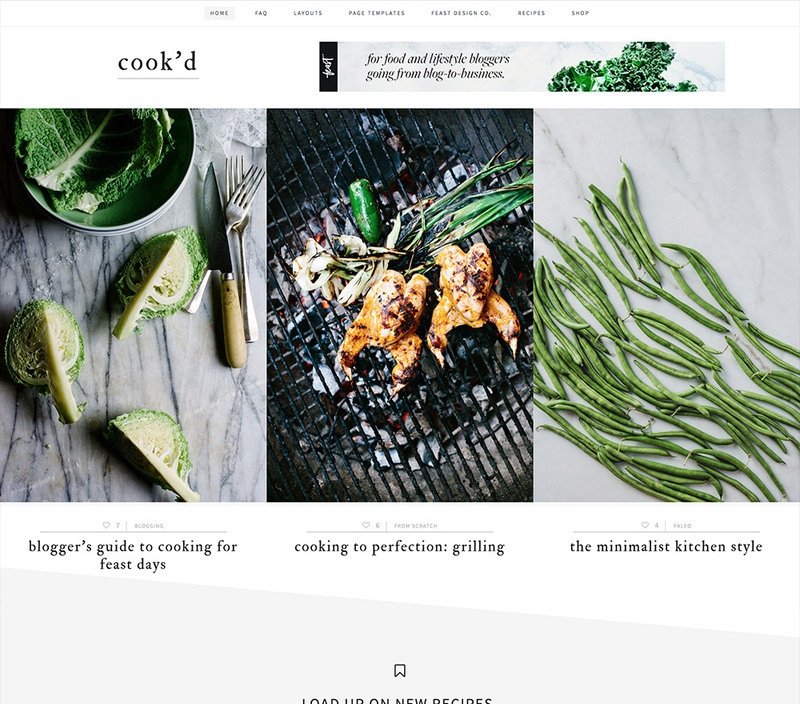 I was looking at lifestyle but don’t like and I’m just not ready for the foodie site even though its beautiful. I dont see a section for ads though, am I missing that? or can that be added in? My site will be a mix of nutritious food combined with lifestyle offerings with a focus on aging. I’d appreciate your comments. Daily Dish is a great theme and could be really cool in the right context. One benefit of Foodie Pro over Daily Dish is the integrated recipe page (not part of Daily Dish), but if that’s not a functionality you were going to use anyway, it might be a great fit. 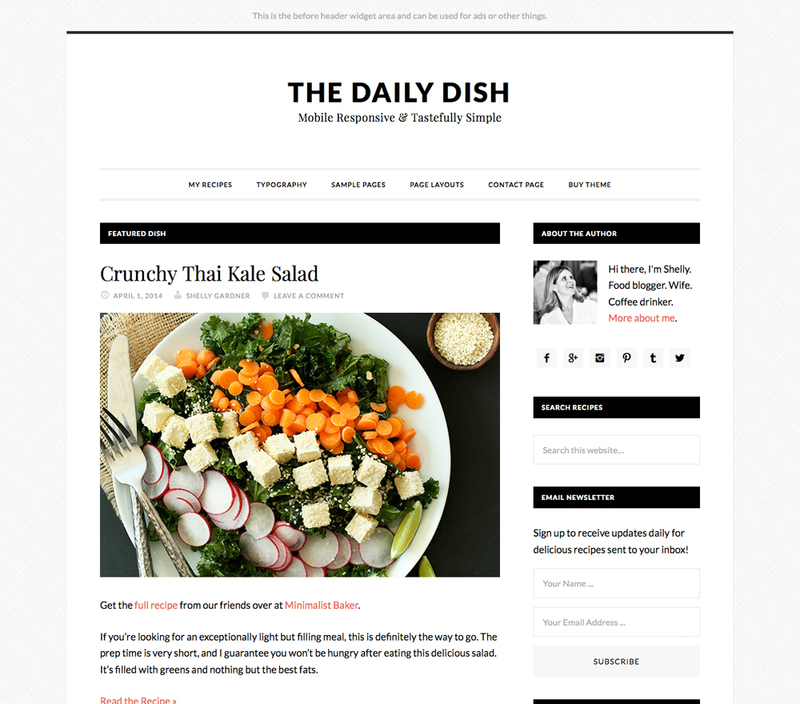 Personally, I like how Daily Dish has a wider content column (placing more focus on your content). If you look at the top and bottom of the theme preview, you can see two places for advertisements. You can also place ads in the sidebar (or probably figure out how to code them in somewhere else if you’d really like). You might need to be careful what size of sidebar ad you would use or do a little manual CSS coding to make sure it fits ads that are 300px wide, but it’s still possible. Or, you could just use ads 250px wide and smaller. Let me know which way you end up going! I’m looking at the Elegant theme page and it only features a $69 subscription as the cheapest? Have the prices gone up since you posted this or do you have a special code I could apply? I purchased the Foodie theme for my grilling and smoking blog and have been incredibly impressed with it thus far. Thanks for the recommendation! I just bought the Food theme for my new food blog. I’m trying to download on my iPad but it says safari in unable to download. Is this because it needs to be done on a PC? You can definitely use a mac, but I’d guess an iPad will be difficult to make it work. Technically, you’re downloading a compressed file (a .zip file) and iPads have a hard time knowing what to do with those. Using a computer should fix your problem. I tired emailing you but that for some reason wasn’t working so I thought I’d comment. I have been taking so much advantage of the awesome tutorials you’ve set up about getting my blog started and using the Foodie theme. I was just wondering if you could help me. I want to add more menu tabs at the top but the theme is only allowing two. I see that you have 4…about, recipes, blogger resources and store. I was just wondering if you could give me some instructions on how to go about adding more or if you could point me in the right direction. I must add my few thoughts to this, even though this is now an older post. Having swopped to Studiopress about six months ago I can categorically say it really makes a big difference. I think the fact that schema is automatically added to blogposts is in itself a boost, and there’s no doubting my bounce rate fell almost overnight as people found the same content easier to read and navigate. Consequently all the pages rose in the serps. For anyone on the fence, I’d say give it a go – it will pay for itself in a week. Thank you so much for your reply earlier today! Your instructions helped me to register on Bluehost and set it up to have my WP.com domain point on my new host. Now I try to be more careful and take time for my decisions. I’m just about to choose a theme and actually I’m in love with one, but first I wanted to ask your opinion as it’s not from one of those bigger, recommended sites and once I purchase something, want to be sure it works. 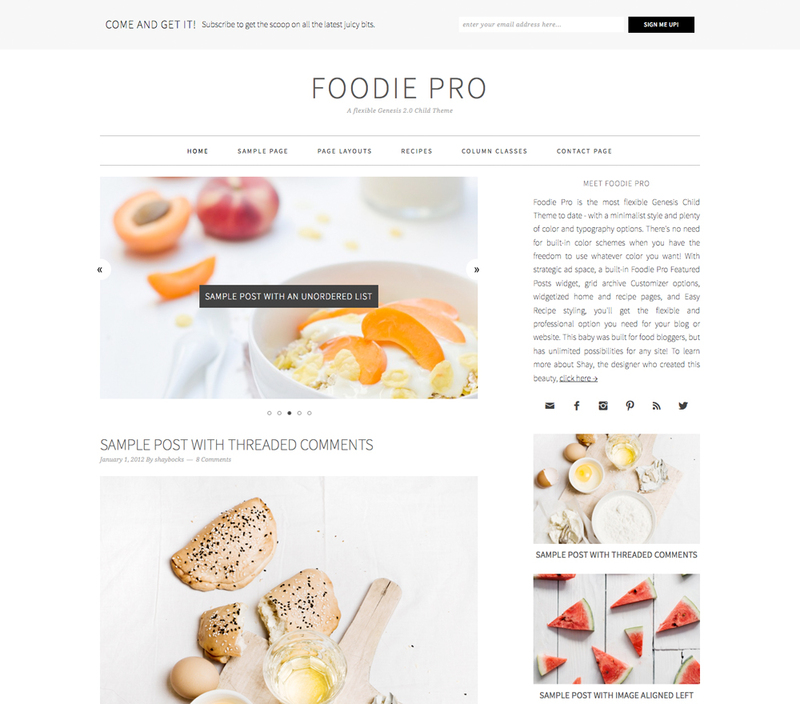 I haven’t personally used that theme, but I have recommended a few other themes from Mojo on my full list of WordPress themes for food blogs (such as Accio and Dessert). If Slappy is the style and theme you like and want to use, I’m sure it would work great! Hi John, I have been on this site and taking in all your advice for the whole day (for me the day is almost finished) and in the next couple of months I am thinking of changing my blog too, I am a new blogger but I want something simpler and more clean cut. The Genesis frame looks great, but what I really want is to have my blog without a boarder. Is that the Genesis frame or is it the theme part and if it is what do I look for? Thanks alot. Hmm, not having a border can mean lots of things, but have you looked into something like Foodie? Themes like Foodie are child themes that sit on top of the Genesis framework. If that’s not what you meant, try to describe what you mean by a blog without a border and I’ll give it a shot! Sure, so, have you checked out Foodie? That seems to fit what you’re looking for in a design. Thanks for all of this wonderful information, John! I’ve had thesis for the past couple of years, but am looking for a new design, and am debating whether to hire a designer or do it myself. My budget is pretty small, so I was thinking about using a Studiopress theme and trying to customize, but I don’t know anything about coding. How difficult is it to customize these sites if you don’t have experience with coding? Can you recommend any books or resources that might help? Thanks! A lot as changed in the past couple of years, so I think you’d be pleasantly surprised with how much you can figure out on your own. Customization is obviously a loaded question. Ultimately, if you can find a theme close to what you want your site to be, you’re going to have a much easier time making it work. On the other end, if you’re looking to have every little detail perfected to an image you have, it’s going to be a lot of work. However, one of the reasons I really love Studiopress is that they have great resources they offer with their products. First, they have a fantastic beginner’s guide. Second, each theme includes specific theme documentation and tutorials. Lastly, there’s a wonderful forum, on which the moderators are very responsive. If you’re just looking to learn coding in general, I’ve personally been using Code Academy. It’s free and designed really intuitively. Thanks, John! I will definitely check out code academy. One more question- Most of the Studiopress themes have a built in mobile responsive feature, but a the designer I’m looking to work with charges a lot more to make a custom designed website mobile responsive. Do you that being mobile responsive is important for a food blog? This is one of those issues that people have lots of opinions on. While I don’t think it’s a matter of life and death for your site, I think it merits your consideration. With our food blog, about 50% of our traffic is from mobile browsers. From what I understand, that’s fairly typical for most food blogs. So, it’s safe to suggest that half your visitors will look at your site on a phone or tablet. Will a mobile site be the difference of your site succeeding or not? No. 1. Google now uses a separate speed test for mobile sites. In short, that means google likes to see mobile sites. 2. Not only are people using their phones more, but the large majority of social media sites are viewed on phones. I guess what I’m saying is that social media can really help your site, and people are using social media on their phones more than on their computers. Making it easy to use your site on a phone makes it more likely to do better or be used in social media. 3. If you create a mobile responsive site, you can also take advantage mobile advertising, which can pay better than standard ads displayed on a mobile device. However, the biggest reason I like mobile responsive sites is that it gives you the opportunity to give your readers a better experience. That’s always the prize winner and top consideration. Lastly, I will note that if your designer is building an entirely new mobile version of your site (which is why I assume the price is so much greater), that you might want to ensure it will be a mobile responsive site. There’s a difference in mobile sites and responsive sites – I greatly prefer and recommend responsive sites. This site is a Godsend! Thank you so much for providing all these resources. I have 2 questions: a) I started a WordPress blog in 2009 but I never used bluehost, or a hosting website, but I did purchase my own domain name from wordpress. Will I run into problems later on? Can I still use bluehost or something similar? and b) This may be a dumb question, but can I purchase a Genesis theme later on and use it without screwing up my content? Thank you! a) You shouldn’t run into problems in terms of transferring or moving your site if that’s what you wish to do. In other words, you can move your site from wordpress.com to Bluehost if you’d like and still keep your current domain name. If you’re asking about the differences in wordpress.com and a self-hosted site (like Bluehost), I touched on the topic in this comment. The short answer is that I think there are multiple big advantages to a self-hosted wordpress site. b) Yes, that should be fine. One of the best parts about wordpress is that you content and data is stored separately from your design and functionality. That means you can change themes, add plugins, etc. as you see fit without losing your content (posts, pages, etc.). However, changing a theme usually does require some time in setting it up and making it display your content meaningfully, especially if you had a prior design you liked. I usually recommend that if you can find a theme you like, getting your site setup as close as possible to your vision now will save you a lot of time moving over in the future. What are your thoughts on WordPress X Theme? Hey Olivia! I think that it’s an interesting concept, but I haven’t personally used it. I’m sure it would be fine, but you’ll spend a decent amount of time learning how to make it work for your site. I’m sure it could work and provide you with a lot of flexibility. Personally, I’ve found it better to find a theme that fits close to what your style is and then figure out how to tweak it from there. It will make getting your site up and running faster, plus there are usually some efficiencies in running a site that doesn’t load a lot of resources you’re not using (which can be a problem with themes that do too much). 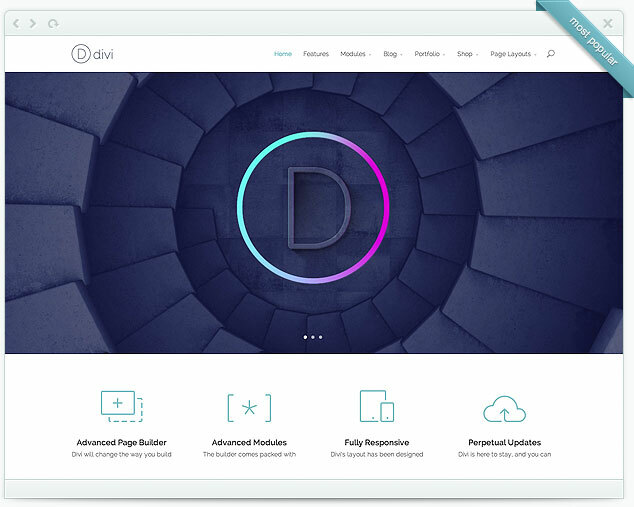 If what has you interested in that theme is flexibility, you might check out the divi theme by elegant themes. I haven’t personally used it either, but it caught my interest for the same reasons. I purchased thesis and was literally disgusted about it because you cannot return it if you don’t like it. It is so bare bones (which they try to market as ‘flexible’). For 200 bucks, it is a sick joke. That’s a great point – if they can’t offer a better refund policy, it makes trying it very risky. Sorry for your disappointment. As you can tell, I’ve had similar opinions. Thanks for all of the tips! Looking to leave my free theme soon and pursue a paid one. I think it will be worth it! And, thanks for all the advice here on this post. If you registered your site through wordpress.com, it’s hosted on their servers. Another way to tell would be if you can install your own theme within your wordpress dashboard (check out the fourth videon on this page for how to install a theme). If your site doesn’t allow this, it’s likely hosted at wordpress.com. Alternatively, you purchased your site and host through a specific service (like Bluehost. Thanks for the note on the themes. Looks like Genesis updated their links. I’ll update this page shortly. Thank you for this article! SO HELPFUL! I was wondering what child theme you use on this blog and also for go miles go? Also any tips on creating custom headers for Genesis? In short, I have a heavily modified version of Metro on this site and a less modified version of the same theme on Go Miles, Go! For the image creation of your header, you might check out this free tutorial. For installing and setting up your header, you can find video tutorials inside this WordPress Master Course. Hi! I LOVE your blog! It’s awesome! I do have a question though! I am on WIX right now.. I don’t like it at all, and my blog is growing so I need something bigger. Do you install/plug Genesis into WordPress? Or are Genesis and Thesis programs you chose and connect to your domain? Confusion! Thanks for all of these amazing resources! Genesis runs on wordpress. WordPress is the base, and Genesis runs on top of it. Transferring form Wix to wordpress is no easy task, but if it’s something you’d like to do, I’d recommend earlier rather than later. I haven’t personally managed a full transfer, but I did help a friend do so. It essentially required manually copying their data to their new site. So, again, sooner rather than later. I do, actually… How do I put my new website on ‘sleep’ mode so I can launch the new one all at once? Thanks for the help! There are a number of ways to do this, but the easiest would probably be activating the coming soon plugin (http://wordpress.org/plugins/ultimate-coming-soon-page/). First of all I have to say that I simply love your food photography! Especially the dark photos are awesome! Then I have to ask a question that has been bugging me for weeks now and I didn’t find a good solution yet: HOW ON EARTH did you make your recipe index? I tried so many plugins and widgets and code loops, but it never looks that perfect. I would really really appreciate if you could tell me how you did that. And please don’t tell me a webdesigner did it for you, because that’s all I heard so far on other blogs…. Again thank you so much for this great inspirational blog and pleeease help me out! In short, yes, I custom coded it. Since it’s something that varies by theme, I can’t really give any advice for the best way to approach it for yourself. One option might be using the gallery feature within your site, but that might depend on how your theme reads the gallery. Haha… oh dear I thought so. Well I could use the gallery function, but then I have to add every single recipe manually…. :) I guess this is the only way to do this then. Thank you so much for your fast answer anyway! Hi! I just bought a ThemeForest and tried to install in into wordpress and the layout in now completely different. There is no upload or add for a new theme. Any thoughts on this? So, did your new theme install, or you’re still trying to figure that out? Still trying to figure it all out. Apparently wordpress requires (me) to get a custom server to upload a theme from ThemeForest. They don’t support adding a new zip file to the theme tab. :( I am a little lost. Ah, are you using wordpress.com? You’d need to either pay for their premium plan or work toward moving onto a self-hosted wordpress site.